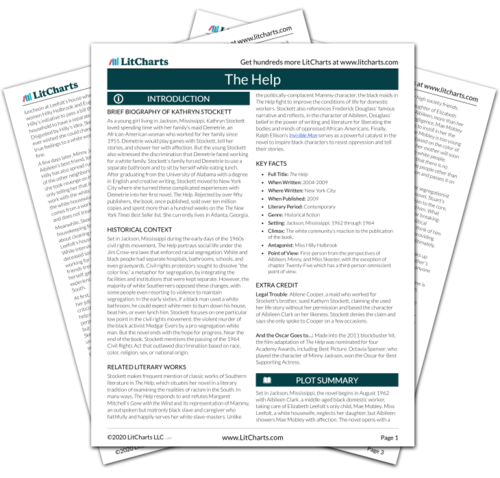 Instant downloads of all 942 LitChart PDFs (including The Help). 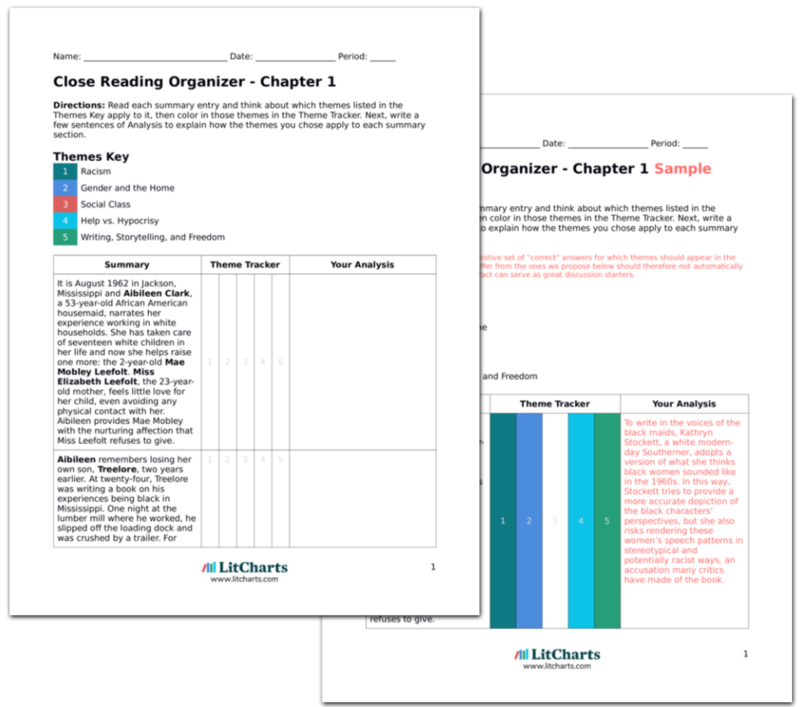 LitCharts assigns a color and icon to each theme in The Help, which you can use to track the themes throughout the work. Lying in bed next to her husband Leroy, Minny fears that Leroy is drunk and will beat her. He doesn’t know about the book’s publication or her role in it, but he can tell something is making her nervous. Only the baby inside of her prevents him from beating her. She thinks about how once she asked him why he hit her. He said, “If I didn’t hit you, Minny, who knows what you become.” Minny wonders what she could become if he didn’t beat her. Racism is not the only oppressive force in Minny’s life. Minny recognizes that her husband’s violence is preventing her from realizing her full potential. Now that Minny finally works for an employer who respects and does not exploit her, she can perhaps now focus on ending oppression at home. The next night, Minny dreams of eating at a large feast and suddenly wakes up in the middle of the night, thinking someone is in the room. She realizes the feeling that woke her was the knowledge that Miss Hilly has just screamed while reading the last chapter. As archenemies, Miss Hilly and Minny have developed a strange kind of psychic connection. Their hate for each other has intertwined their thoughts and feelings, giving them a paradoxical kind of intimacy. Plaue, Ethan. "The Help Chapter 32." LitCharts. LitCharts LLC, 4 Oct 2015. Web. 21 Apr 2019. Plaue, Ethan. "The Help Chapter 32." LitCharts LLC, October 4, 2015. Retrieved April 21, 2019. https://www.litcharts.com/lit/the-help/chapter-32.